It's our birthday and we're celebrating by sharing our favorite birthday recipes featuring our very own Signature birthday cake-flavored whey protein powder and protein bars! It's our birthday, and we'll lift if we want to! To celebrate twenty years of inspiration, motivation, and supplementation, we're bringing back one of our most popular flavors ever: birthday cake! And for an extra-special treat, we're also launching our new Signature Birthday Cake Protein Crunch Bar so you can enjoy that same celebratory flavor as an on-the-go snack! But that's not all. We've also compiled a list of our favorite recipes featuring Signature Birthday Cake Protein Powder so you can celebrate with your own healthy homemade birthday treats! Finally, a protein powder that's absolutely made for cupcakes! 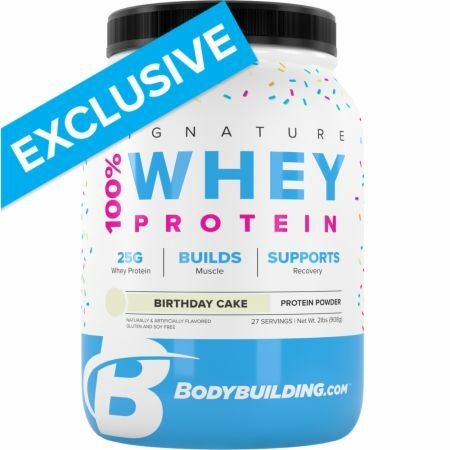 Signature Birthday Cake Whey Protein pulls double duty as the base of this fluffy and delicious cupcake recipe and the thick and scrumptious icing on top. With healthy ingredients like Greek yogurt, applesauce, and coconut flour, you can enjoy this healthy treat for breakfast, lunch, dinner, and dessert! What better way to start your special day than with a stack of birthday pancakes? Coconut flour keeps these pancakes low carb, while applesauce and a sugar substitute keep them healthy and low sugar! Add sprinkles for an extra-fun twist on this instant birthday breakfast classic! Craving something golden brown and crispy for breakfast? These healthy protein waffles have you covered! Use regular or gluten-free flour as the base for these birthday cake waffles, and double the batch so you can save the extras for healthy breakfasts on the go! Add your favorite cheat-day toppings like whipped cream, syrup, and sprinkles for a truly decadent breakfast celebration! Mixing protein powder into oatmeal is a tried-and-true move for most lifters, but not like this. Instead of a sludgy mix of powder and oats, this recipe calls for dairy-free almond milk, a dash of vanilla, and a variety of suggested additions to add richness and flavor—and, of course, protein—to your morning bowl of oats. If you don't have time to eat birthday cake—let alone make it—this is the shake for you! Almond milk and frozen banana add creaminess while still keeping this shake light and dairy free, and optional additions like cashew butter add richness to your on-the-go dessert. With this delicious birthday shake recipe, you can finally have your "cake" and eat it, too! Mmmmm…donuts. If a dozen of these popular deep-fried dough wheels can tempt you to stray from your macros, have no fear: Our birthday cake donuts are high-protein, gluten-free, and totally delicious. Made with almond and coconut flours and sweetened with a sugar substitute, you can indulge in these lower-carb, high-protein donuts without sabotaging your goals. Get that extra-large coffee cup ready for dunking, because this is one birthday treat you'll want to enjoy every day! You might never go back to brownies again once you give these healthy homemade blondies a try. Instead of double chocolate, you've got double birthday cake with both Signature Birthday Cake Whey Protein and chopped Signature Birthday Cake Protein Crunch Bars. Coconut flour and cashew butter add moist decadence to this birthday dessert, and as always on birthdays, sprinkles are encouraged. Just be sure to make enough to share! Can't decide between cookies or cake? Why not both?! You won't even miss the frosting when you bite into our birthday cake cookies. With coconut flour, white chocolate chips, and sprinkles, these birthday treats are everything a protein cookie should be. Make a double batch for a party or whip them up for a tasty protein treat any day! Sarah Wilkins is a nutritionist, business owner, researcher, and author.